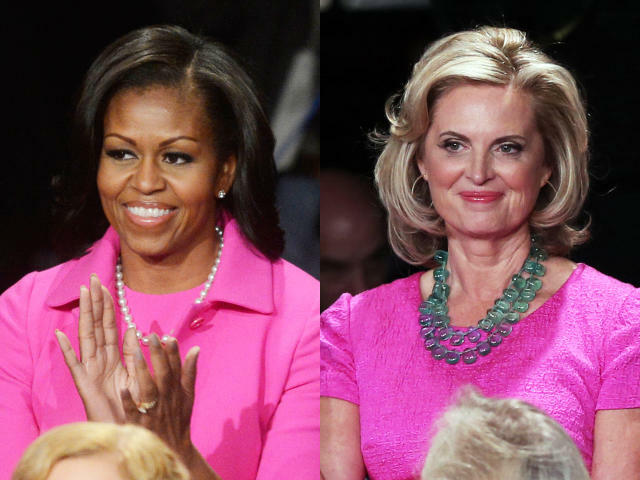 While their husbands represent opposing political parties, Michelle Obama and Ann Romney were on the same page Wednesday night, both wearing bright pink to the event. The two women not only both wore pink, but they wore the same exact shade, which has been dubbed "Pepto pink." There has been some speculation that the color of their ensembles was influenced by the fact that October is Breast Cancer Awareness month. Michelle Obama went for a classic look, wearing a high-necked fitted knee-length dress with a three -quarter length jacket, all designed by Michael Kors. The first lady accessorized the look with a single string of pearls. Ann Romney wore a fitted tweed-textured cap-sleeved shift along with a double strand of aqua-colored beads. While there has been no official word on who designed her look, there has been a lot of speculation that it was designed by Alfred Fiadaca, who has been shaping up as her go-to designer.